Large Family Travel Card: discount calculated in accordance with current regulations. Where can I buy Metro tickets and cards? The BonoMetro card can be purchased from any of the ticket vending machines located within the various Metro stations. 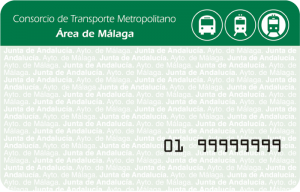 The Consortium Travel Card can be bought at any of the sales points authorised by the Malaga Area Metropolitan Transport Consortium. To acquire the Large Family Travel Card, see the Tickets and Travel Cards section of our website. Where can I top up my Metro Travel Card? The BonoMetro card can be topped up at the ticket vending machines in the Metro stations. 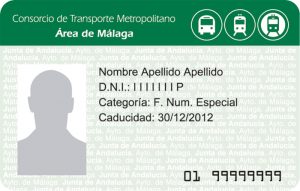 The Consortium Travel Cards (Standard and Large Family) can be topped up at authorised Malaga Area Metropolitan Transport Consortium sale points, as well as at the aforementioned Metro vending machines. The cost of the initial bus ticket depends on the number of fare zone crossings for which the Consortium Card has been configured: zero crossings – €0.93; one crossing – €1.07; two crossings – €1.43; three crossings €2.36. 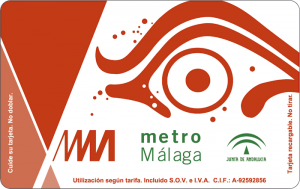 The cost of the second ticket when transferring to Metro Malaga, again using the Consortium Card, is €0.65. The cost of the Metro ticket is €0.82. The cost of transferring to a long-distance or local bus depends on the number of fare zone crossings for which the Consortium Card has been configured: zero crossings – €0.76; one crossing – €0.90; two crossings – €1.26; three crossings – €2.19. * Transfers between long-distance buses, and between long-distance and local buses. Transfers between EMT local buses are free for the first hour of the journey. At the start of the journey, the Travel card must be placed in front of the card reader at one of the turnstiles located in the station of origin. The same procedure is later repeated at the station where the journey ends. Passengers have 90 minutes in which to complete their journey. If this period is exceeded, a second journey will be deemed to have begun, and the corresponding fare will be charged to the Travel Card. As on long-distance buses, up to 15 passengers may use the same Travel Card, providing no more than 3 minutes elapse between the purchases of the first and last ticket. This condition does not apply to the Large Family Travel Card, which is issued to a named individual and may not be used by anyone else. Within the Consortium’s metropolitan fare zone system, Metro journeys are deemed to involve no fare crossings, as they do not take the passenger beyond the boundaries of Zone A. This means that Consortium Cards for use on the Metro may be configured for 0, 1, 2 or 3 crossings, with 0 crossings being the cheapest option for this type of journey. For further information, see the Fares section of our website. At Easter and during Malaga’s August Fair, and also when other events leading to increased demand are in progress, special services may be provided. 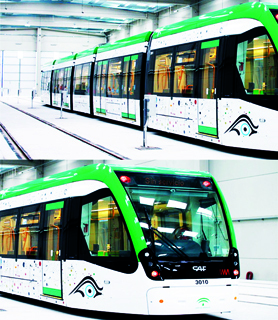 For further information, visit the MetroMálaga website. Click here to view details of the stops on lines 1 and 2 via Metro Malaga’s own website. For a list of Frequently Asked Questions about the Metro, click here.